After the wedding I got to stay longer in Arizona while the hubs went back to work. So up to the Watson's I went. It is always fun staying with these guys since they are right in the throws of school, sports, callings and such I get to see what lies ahead for my own little family. One night before bed they all wanted to read together. Camryn actually paid attention to a book on planets and stars-she doesn't do this at home. Dylan and Carter are good examples for her. 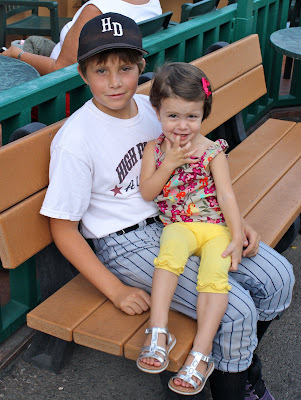 The first grandson Jake with the first granddaughter Camryn! Didn't put that together until now. Just beforeJake's baseball practice we grabbed a bite to eat at their favorite restuarant Oregano's. It didn't disappoint. Nikki and her cute boys. They even let you play with a hunk of pizza dough while you wait. Camryn loved that! This is what it is like riding in the car with multiple kids in the car. Always something going on=Camryn stays quiet. Wish I could adopt these guys just for car rides, well and maybe other times too. I love this actual smile we are getting from Carter! Me and my sisso. Twins? Some say so. 9 years a part, but you would never know it! Because this is what we really like to do. Is that a hot dog in my mouth? It looks like it. Sick. Dylan then joined in, but we couldn't get Camryn. Love Carter's asain eyes in this one! My personal fav. This is what we did while Jake's practice was going, I promise we did watch him! What can I say we have fun where ever we are! Thanks guys for having such a rad family and letting us crash for while! We love you! Looks like a party....and it does look like a hot dog. That is something to be proud of. Glad you had fun times in Arizona with your sis! And yes you guys are twinners! I love that Camryn is still dressed in summer clothes, those days are long gone for us! Those funny face pictures are AWESOME! Hilarious! What fun to get some play time in AZ! Love the picture of Jake and Camryn, and she looks so darn cute surrounded by all of those boys. Oooh such a fun, fun visit! I love hangin' with you and Camryn and the awesome faces you pull when we watch baseball. I'm sorry we were so busy and annoying. I will be a twin with you any day! Oh you had me full on laughing at those last silly pictures!!! Love it! I also love the picture of Camryn on Jake's lap.